As a boy growing up in Three Bridges, N.J., Matthew Opdyke waded into the local river every spare moment, digging through the sediment and turning over rocks to find clams, snails and insects. He loved the thrill of discovering what other people didn't see. Three decades and many scientific papers later, Opdyke, associate professor of environmental studies at Point Park, still feels that boyhood wonder of exploring nature and passes that exhilaration onto students who accompany him into the woods and streams. His frequent field trips have made him a favorite of students such as Michael Bowen, (A&S '15), who earned his degree in education last May. "He did a great job of bringing the field work into the classroom, which is what science is all about." Opdyke's hands-on teaching style goes beyond field trips. He has landed external grants so students can conduct their own research and help him do studies about aquatic ecology, wetlands restoration and lichens as an indicator of air quality. 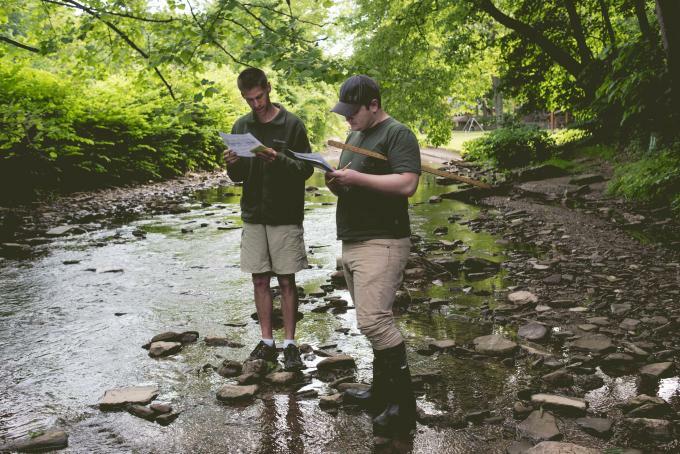 Last summer, Opdyke and biology students in the environmental science concentration donned waders and stepped into Lowry's Run steam near McCandless to collect insects and study the diversity, which was limited because of the effects of development. Matthew Love (A&S '15), came up with the research project and was grateful for Opdyke's help. "He is patient and willing to work with students to achieve their goals," said Love, who recently completed his degree in biology. "He was willing to take time out of his summer to help me complete an independent study for my degree." In 2014, student Joshua Daugherty and Opdyke conducted a lichen diversity survey at Pymatuning Laboratory of Ecology. Lichen, formed from a symbiotic relationship between algae and fungi, is sometimes found on trees and concrete. They are sensitive to air pollution. "If you see a lot of lichens, it is a good sign for air quality," Opdyke said. Their findings will be published in Evansia journal next year. Sometimes the field research is an adventure. On a chilly March morning in 2013, Ingrid Reiland (A&S '13) and Opdyke paddled a kayak onto the Allegheny River to reach Sycamore Island, located near Blawnox and owned by the Allegheny Land Trust. Opdyke taught her how to core the trees to determine their age. "It was a little terrifying," said Reiland, who now works as an ecologist for an environmental consulting firm in Pittsburgh. "I had never used a kayak before. The water was choppy, with barges going past. My arms were exhausted coring trees." But Opdyke raised her spirits. "He is the constant cheerleader. He is constantly giving you pep talks. He always makes it fun." The two made a poster illustrating how hydrology and climate affect tree growth and showed it during the Association of Environmental Science and Studies conference in Pittsburgh in 2013. Opdyke also was awarded a grant from the Coldwater Heritage Partnership to study the effects of acid rain on Fishing Creek Watershed in central Pennsylvania. Streams with acid rain have fewer insects and fewer trout. "Fishing is a big industry in Pennsylvania." Opdyke honed his research skills earning his Ph.D. at the University of Illinois in Urbana-Champaign studying how agriculture affects streams. He then pursued a postdoctoral research position at Michigan State University in East Lansing. He has watched some students go on to graduate programs and others land jobs with consulting firms. The fieldwork he encourages can give them the edge in the job market. Biology graduate Bryan Dolney (A&S '09) said the two-year study he did on lichens under Opdyke's guidance made all the difference in him securing a job as an ecologist at the Pittsburgh Parks Conservancy. He presented his research at the PA Academy of Science and Ecological Society of America, and the professor and student published an article in PA Academy of Science journal. "Dr. Opdyke is a great mentor," Dolney said. For Opdyke, there is no better way to spend his days than helping future scientists. "If I could, I would spend every class outdoors doing research with students. You get to know students one-on-one and their passions."